EghtesadOnline: Iran's gold demand more than tripled in the first quarter of 2018 while Saudi Arabia's dropped 15%, data released by the World Gold Council show. Iranians placed a lot more bets on gold in the first quarter after the local currency weakened to a record low and fears grew that the US would pull out of the nuclear deal, signaling a return to sanctions. Gold coin and bar demand in the Persian Gulf nation soared to 9.3 tons in the first quarter, a three-year high, on “investor concerns over worsening Iranian-US relations and the prospect of currency controls”, WGC said Thursday in a report. US President Donald Trump will decide by May 12 whether to keep America in the international agreement that restricts Iran’s nuclear activities in exchange for relief from sanctions, Financial Tribune reported. The rial hit record lows against the US dollar over the past few months. In April, the government took measures to unify the rial’s rates against the dollar. 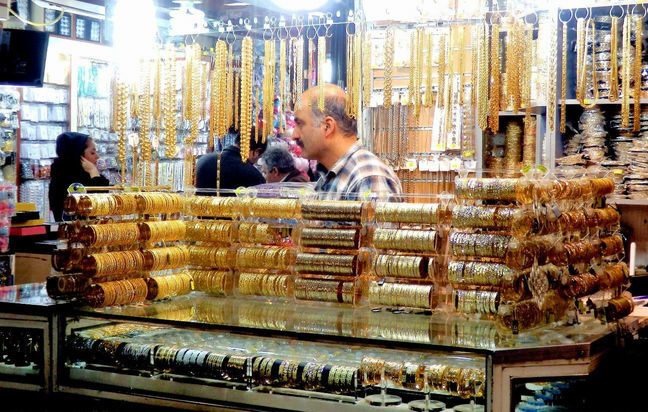 As opposed to demand for coins and bars, Iran’s consumption of gold jewelry declined 16% in the first quarter from a year earlier to 10.7 tons, the report said. "Buyers looked to bars and coins as an investment rather than jewelry after the government imposed a 9% value-added tax on gold jewelry last year," said Alistair Hewitt, the council’s head of market intelligence, Bloomberg reported. Amid a sharp fall in the value of rial in late February and in order to drive investors toward the formal currency market, the Central Bank of Iran issued rial-based Certificates of Deposits. The bank also launched the sale of gold coins at attractive prices to reverse the longstanding rally gripping the market. CBI also increased the supply of gold coins in the first quarter, reducing the premium “a bit”, Hewitt said. In the UAE, the introduction of a 5% VAT contributed to a 23% year-on-year decline in gold jewelry demand, with the 10.5-ton total the lowest of any first quarter on record, the council said. “Consumer sentiment was further undermined by rising living costs and fears over job security,” it said. The UAE Cabinet said in a May 1 statement that it exempted investments in precious metals, including gold, from the VAT. This is while worldwide demand for gold totaled 973.5 tons in the first quarter of the year, according to the council's latest report, down 7% year-on-year. The slump in demand for the precious metal also coincided with prices holding within their narrowest range of any quarter in more than a decade. The trade group that represents the commodity blamed the fall on a 15% dip in investment in gold bars to 254.9 tons, as investors in the US, China and Germany held off from buying the yellow metal. "Relatively solid global economic growth, coupled with the return of volatility in the capital markets in February, created a stable environment for gold (in the first quarter)," Hewitt was quoted as saying by CNBC. Just 32.4 tons of gold flowed into gold-backed exchange-traded funds over the first three months of the year. That was down two-thirds when compared to the same quarter of last year. Jewelry consumption also slipped at the start of 2018. India—the second-largest gold jewelry consumer after China—reported its weakest quarter since 2008, falling 12% YOY to 87.7 tons. Traditionally viewed as a safe-haven asset in times of economic stress, gold demand had surged in the first three months of 2017 amid elevated geopolitical uncertainty. However, more recently, the precious metal has traded in a narrow range of $1,300 to $1,350 an ounce as investors have appeared to lack a clear signal. Central banks bought 116.5 tons of gold (+42% YOY). Technology demand extended its recent upward trend, growing 4% YOY to 82.1 tons. The total supply of gold increased by 3% to 1,063.5 tons, primarily due to a modest increase in producer hedging. Mine production was fractionally higher at 770 tons.